Cardboard is a heavy-duty paper featuring in multiple corrugated and non-corrugated layers. It is found everywhere for storage, packing and just get discarded. Dumping of waste is the first step to pollute the earth. Let’s avoid it by reusing these cardboard boxes as amazing functional eco-friendly decors at home. 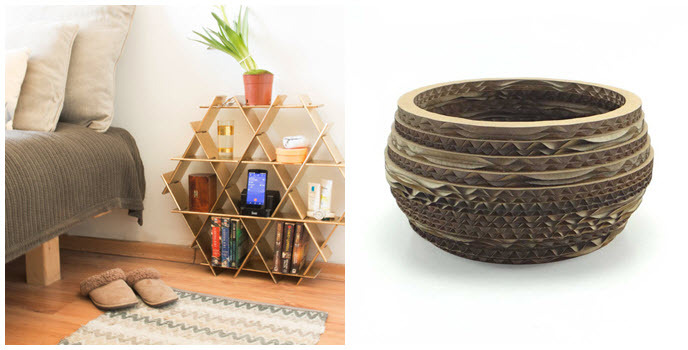 These unique décor ideas using cardboard will add a green touch to your interior décor. Organizing and stylish display together is always possible with the docking station black dachshund, sheep shelf desktop that looks perfect for living and study rooms. Digital files for your own easy, step by step assembling is available. Can also plan to order custom designs to suit the style of your home décor. Wall hangings with fun colors and cartoon patterns will create a delightful mood in your little one’s room. 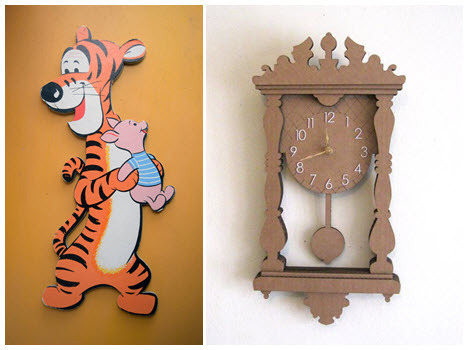 Try hanging up the Tigger and piglet cardboard cutout to open up a playful atmosphere indoors. The cardboard pendulum clock is the best one that fits to add accent to any space at home. Manage your tasks timely with this eco-friendly clock. 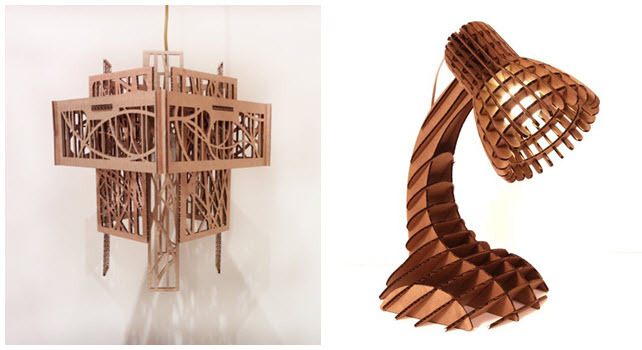 Amazing cardboard furniture models are ready to replace your old furniture. The accent folding leg stool is colorful and cute to brighten up your décor. The cardboard seater with cushion for extra comfort is cool and unique in its looks suitable to decorate patios. Decorative chandeliers will brightly dress up the ceilings with its stunning beauty. The recycled square chandelier is an eco- friendly modern décor that adds trendy luxury to interiors. The cardboard desk lamp is an amazing design of creative usage of paper to light up your mini tables. Bed side tables are must to hold lamp, glasses, creams, books, cell phone and lots more. The cardboard bed side night stand is the ultimate storage solution for your comfort zone. The decorative cardboard bowl looks great as a fruit basket in your dining table. The unusual appearance of the cardboard makes it a cool and creative décor to fresh homes. Ready to taste? Please wait it’s a cardboard art food sculpture. 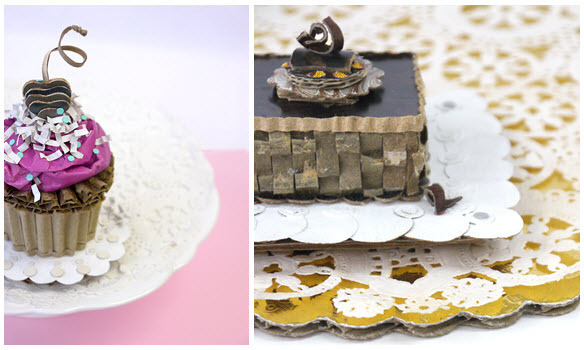 The cupcake with pink butter cream, chocolate truffle sculpture are yummy treats for your dinning décor. Just take a look at it, coz they are treats only for your eyes. Adding vintage touch to interiors will take you back to the treasurable memories of past. The vintage velvet fabric cardboard suitcase of the 40’s can be a very trendy décor for rustic theme. The waxed cardboard Canadian goose transforms the mantel into an eye-catching focal point for any holiday décor. Using recycled cardboards in home décor will automatically reduce the usage of plastic and also saves cutting down of millions of trees. Try to avoid picking disposable items which is the biggest threat to our mother nature. Choose eco-friendly cardboard decors to create a greener atmosphere at your sweet home. Unique pics related to the topic is always welcome.